Winnipeg police are off to a white hot start so far, as the first weed-related traffic ticket has already been issued. The first ticket was issued by Winnipeg Police Service traffic division inspector Gord Spado around 1AM when he found somebody getting lit in their car — that’s only 59 minutes after the green good stuff was legalized. “An hour into legality, and something illegal,” said Inspector Spado. Winnipeg police quickly took to Twitter to share the news. The tweet garnered a ton of negative responses pretty quickly, with many people seemingly upset with the new rule. One user even went so far as to ask if Spado could have been sure that it was even THC that the perp was smoking. How did you know that this cannabis had THC in it? Is it ok to smoke Pot without THC in your car? Some people use pot for the CBD? Would you ticket someone for a non-alcohol beer in their car? According to Spado, it will be hard to say for sure if weed was acquired illegally. Same goes for edibles, as it will become increasingly difficult to tell if the snacks people consume in their car are actually just regular snacks. Don’t let the passive Canadian stereotype fool you — the perpetrator was hit with a hefty ticket in the amount of $672, which isn’t even the most expensive marijuana-related fine you can receive. 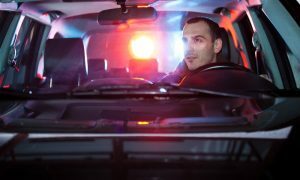 While a driver carrying cannabis on them can rack up a $237 ticket, consuming cannabis in a car either on the highway or off-road will run you $672. Same goes for smoking or vaping in a public place or provincial park. These fines are nothing in comparison, however, to growing non-medical cannabis in a Manitoba County residence or supplying it to a person under 19. Those things will cost you a cool $2,542. It also goes without saying that driving under the influence can be dangerous; a recent study done at McGill University showed that waiting at least six hours after consumption is the safest time to drive. So, take it slow, Canada. No need to ruin a good thing right away.